In order for a green office scheme to function effectively it is important to consider the eco-friendliness of the products coming into the office as much as those going out. An office recycling scheme doesn’t end when the waste materials are collected. This is only the first stage of programme – the next step is the sorting and cleaning, then the reprocessing and manufacturing before finally the purchase of the recycled goods. The final stage is as important as the first - if the items are not sold on for reuse then the whole scheme is redundant. Therefore, an office needs to purchase products made partially or wholly from reclaimed materials in order to make the scheme a complete and sustainable one, and also help sustain a thriving and economically viable green marketplace. What actually is a Recycled Product? One of the headaches involved with purchasing environmentally friendly products is understanding the green definitions and claims of the products. Being aware of the many terms associated with green products will prove useful when drawing up the specifics of the environmental purchasing policy. For example, if a product is described as being ‘recycled’ then it doesn’t necessarily mean that it has been made out 100% reclaimed materials. A recycled item is one that is at least partly made up of materials that have been recovered or previously manufactured. Recovered materials could either be pre-consumer or post-consumer resources. 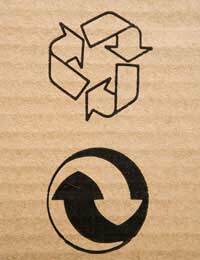 Post-consumer materials are those that have been used and collected through recycling schemes. Pre-consumer – or post-industrial - refers to materials that have been reprocessed from the waste produced during the manufacturing process, such as off-cuts or damaged items. Therefore when purchasing a ‘recycled’ produced it worth bearing in mind that although two items could both be labelled as being recycled, one could be made up entirely of post-consumer waste whilst the other could be a composite of post-consumer and pre-consumer and fresh new materials. Energy saving – designed to help improve your energy efficiency. Water saving – designed to help reduce water use. Chemical free and natural – made from natural substances and not containing any chemicals or other synthetics. Biodegradable – made out of materials than can be naturally broken down. Sustainable – made out of natural materials that can be grown and used indefinitely or could refer to products that promote a sustainable lifestyle. Organic – refers to organic foods that are grown with the use of additives or chemicals and not genetically modified. UK or locally produced – manufactured in the UK or locally to support the local market and cut down on transport emissions. As more and more shoppers are starting to consider ethics when purchasing items, environmentally friendly products are becoming big business as well as a powerful marketing tool. It’s not surprising then that there are now a great number of suppliers that have set up solely to provide green products to businesses. Of course, as eco-friendly items are no longer a niche market, established general suppliers will also stock the more popular environment products, such as recycled photocopier or printer paper. Therefore when adopting a green purchasing policy it is wise to first discuss you new requirements with your present supplier to see whether they can accommodate them, before switching to specialist supplier.